Chhattisgarh Tourism’s tagline reads ‘Full of surprises’, and it couldn’t be more apt. Archaeological ruins, ancient temples, different tribal communities and their unique musical notes and dances, Sirpur had a lot more to offer than I was able to explore. A small town situated close to 94 km away from Raipur, Sirpur hosted Sirpur National Dance and Music Festival’s third edition this year. I was graciously invited by Chhattisgarh Tourism to attend it and I am so grateful I had the opportunity to visit a state that has been marred by a history of crime and violence creating a volatile environment for outsiders. But once you are there, you realise that there is another side to this state that sadly gets shrouded under its foggy past. This is why the Sirpur National Dance and Music Festival has been a successful initiative in showcasing the state’s oft-ignored talented artists and local art forms. From percussionist Pete Lockett and santoor player Rahul Sharma to saxophonist George Brooks and Kathak’s most revered exponent, Pandit Birju Maharaj, this year saw a blend of Indian and international artists perform on one platform. But the musicians who stole the show were the tribal percussionists from a group known as Taal Chhatisgarh. The stage was set against the backdrop of the Laxman Temple, one of India’s oldest brick temples. Sadly, the temple was not quite visible from the audience seating as the stage comprised giant replicas of dancing deities, together with pillars bearing intricate carvings representing some of the prominent archaeological finds in Sirpur. While many of the attendees were offered special invitations, there were a huge number of locals present as well. As an initiative to allow locals at Raipur to also come for this festival, the tourism board organised about seven buses that would ply to and from Raipur for attendees, explained Mr Santosh Misra, MD, Chhattisgarh Tourism. Here are some of the highlights of the three-day event. The inaugural day began with a performance by Rekha Dewar presenting ‘dewar geet’—songs of joy and merriment that represent the tribal culture of the Dewar sect of Central India’s largest tribe, the Gonds. This was followed by Danda Nritya by Sampariya and Group—a stick dance celebrating Chaitra Parva or the arrival of spring. Other notable performances included the graceful kathak dancer Yasmin Singh of the Rajgadh gharana and abhangs by Shounak Abhisheki and Asha Khadilkar. The performance that stood out though the amalgamation of sounds created by 50 tribal percussionists and their unique musical instruments, together with Grammy Award winner Pete Lockett. They were joined by other well-known percussionists such as Giridhar Udupa on the ghatam, Swaminathan on the kanjira, Anubrata Chatterjee on the tabla and Umar Faruq on the bhapang. It was quite a spectacle to see the tribals in their local garb. The ensembles were colourful and distinct, making each one stand out from the other. On the second day, it was santoor maestro Rahul Sharma’s impromptu collaboration with Rajasthani folk musicians that got the audience asking for more. It was the first time I had seen Rahul Sharma perform. I am not an ardent follower of classical music, but I really enjoyed listening to the delicate tunes of the santoor. Among other performances on this night were devotional songs on Maa Durga by Anuradha Paudwal and Group; an Odissi dance presentation by Purnashree Raut and Lucky Mohanty Troupe; Gaur Nritya by Maya and Group; and Panthi Nritya by Uttam and Group. My personal favourite on day two though was Taiko drumming by Leonard Eto and Group. Taiko (meaning fat drum) are Japanese percussion drums, usually of different sizes. Leonard Eto, one of the most prominent Taiko drum players, has been playing since almost 30 years. He radiated with bursts of energy and his synchrony with his team of two was incredible. I was quite mesmerised by the music, tapping my feet and doing dance moves in my head! I hope to attend more of his Taiko drumming performances in the near future. On the last day I had the honour to watch Kathak legend Pandit Birju Maharaj perform. After his students completed a series of dances, he took on the stage himself and enthralled the audience. At the age of 76 and on a seriously cold winter night where even he was wrapped in a shawl till the moment he took to the stage, Panditji performed with so much energy and grace; it was inspiring. He combined his dance steps with a dash of humour and said “It is so cold that you are unable to clap with both your hands.” This of course drove the audience into a clapping frenzy and many even gave him a standing ovation. He also said, “I am feeling so cold, but yet I can keep going all night as the conversation between the ghungroos never stops...” It was a pleasure to see a legendary artist like him being so humble and dedicated to his art. Yet another memorable performance was the result of a merging of Indian and western artists. 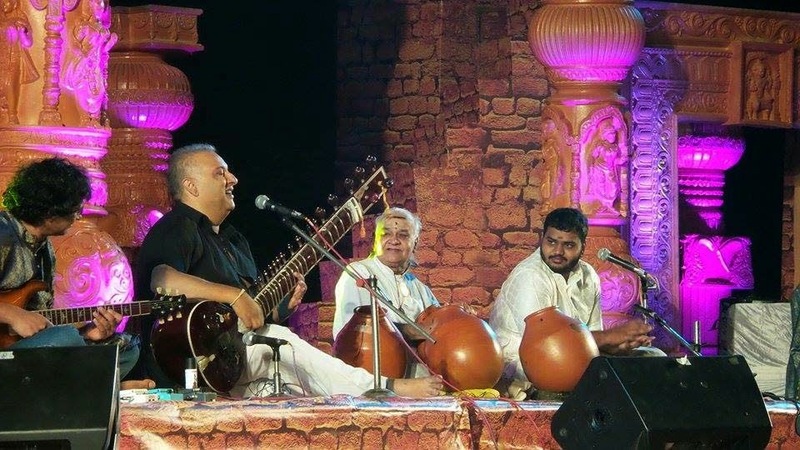 Sitar player Ustaad Shujaat Khan, ghatam player Vidwan Vikku Vinayakram, guitarist Prasanna and saxophonist George Brooks together created a magical symphony. For me, it was Vinayakramji command over the ghatam that really stood out. He so effortlessly played the instrument with such finesse. For more information, log on to the festival’s official website. While its history seems a tad morose, Mauritius in its present day is a thriving island—a modern-day heaven much like Mark Twain described. One of the truly amazing things about Mauritius is how peaceful its people are. With residents from India (almost 60% locals are of Indian origin), Africa, Europe and Asia, you would expect some amount of disturbance or inter-cultural clashes. But I was pleasantly surprised to find that Mauritians are a peaceful people. Religions like Hinduism, Buddhism, Islam and Christianity co-exist in harmony. Unlike India, where religious debates and inter-racial politics dominate the nation, Mauritius welcomes everyone with open arms and an open mind. If this doesn’t constitute a heaven-like abode, I don’t know what does. Free education: On my way to the airport to catch my return flight, I had a long conversation with my cab driver. He told me that the Mauritian government offers free education to all its citizens until HSC. A great initiative, which ensures that every citizen is educated at the basic level. This explains why the literacy rate is as high as 90% here. Barely any traffic: Being a small island with a population of 1.2 million (which includes Rodrigues and the outer islands), there’s nearly no traffic in most of the areas of Mauritius. You may encounter some traffic in prime areas like in its capital of Port Louis or the touristy Grand Bay, but it is nothing compared with cities like Mumbai, Delhi or Bangkok that are known for their insane traffic situations. No poverty: During my trip, I visited many areas in all the four corners of Mauritius and nowhere did I come across any sign of poverty. Even locals who work as hired help have small-sized concrete homes. To me this indicates that the people here are living decently, with basic amenities provided. Low crime rate: All through Mauritius, I barely ever saw a policeman on the road or any requirement for one. Mauritians I noticed follow traffic guidelines very strictly, which reduces the chances of car of bike accidents. Even at late hours of the night, they stop at a red light even though there is no other vehicle in sight. In addition, the penalties for talking on the phone and driving or driving without a seatbelt are quite high (almost MR 500 and above I was told), which urges people to follow the rules. I was told that the only crimes that are committed often here are alcohol-induced brawls. Aside from these, there are very few incidents of crime in Mauritius. Short distances to travel: Travelling from north to south will barely take you two hours as the entire island is quite small. It is spread over a mere 2,040 square kilometres. If your version of ‘heaven’ is of a flourishing island in the midst of the ocean surrounded only be happy people and plenty of space, then Mauritius certainly is it. Mark Twain it turns out was right. Before I made my way towards Mauritius this past December, I read several articles online that mentioned one quote which stood out. Mark Twain once said: “You gather the idea that Mauritius was made first, and then heaven, and that heaven was copied after Mauritius.” Though I was already sold on visiting the tiny island after seeing mesmerising visuals of tourists wading through its turquoise blue waters and walking by the white sand beaches, this certainly increased my curiosity. Surely Twain’s words had more depth than the mere visual of the deep blue Indian Ocean housing this piece of heaven. So I attempted to find out what makes Mauritius so special. Is there more to it than being one of the most popular honeymoon destinations? After several conversations with the island’s residents and observations I made during my trip, here are my findings. Mauritius sits in the middle of the Indian Ocean to the east of Madagascar. It is said to be the creation of volcanic activity that took place under water. The Arabs fell upon it back in the 9th Century. But it was only in the 16th Century that the island had its first visitors: the Portuguese. Oddly, the Portuguese were not impressed and left soon enough. The Dutch however were clearly beach lovers as they stayed on when they came in 1598. They were not only the first to colonise the island, but they also gave it a name. They called it Mauritius, inspired by their then ruler Prince Maurice Van Nassau. A dodo-shaped water toy at Le Prince Maurice. No rubber duckies in Mauritius! While they are attributed to naming this stunning island, they also played a huge role in the extinction of Mauritius’ national animal, the dodo. I was told by many locals that the Dutch enjoyed dodo meat and literally ate all the dodos until there were no more! I could only imagine how helpless the poor birds were in procuring an escape seeing that they couldn’t fly. And since dodos only were indigenous to Mauritius, their extinction was inevitable. But Mauritians chose to keep their memory alive. And so, despite its extinction the dodo remains Mauritius’ national animal till today. You will find numerous products featuring illustrations of the dodo. In fact, even the Mauritian Rupee note features the flightless bird! Look at the left-hand side corner near 'RS'. See the dodo? After the exit of the Dutch, and the extinction of the dodo, it was the French who took control of Mauritius between 1715 and 1814 when they surrendered to the British under attack. They even changed the name to ‘Île de France’, but once the British took over they reverted to Mauritius. Aside from attempting to make English the official language (which did not happen as according to the Treaty of Paris, the population was to keep its language, its religion and its laws), the British decided to abolish slavery. Seems like such a noble act. Unfortunately, it wasn’t quite as noble as it seemed. After they freed the slaves, they realised they still needed people to work in the sugarcane plantations that comprise 80% of the land in Mauritius. So, they sought ‘indentured’ labourers from India. They were brought to Mauritius under a labour contract, but were made to work much like slaves. Chinese and Muslim traders too came to Mauritius history dictates attracted to the possibility of employment. 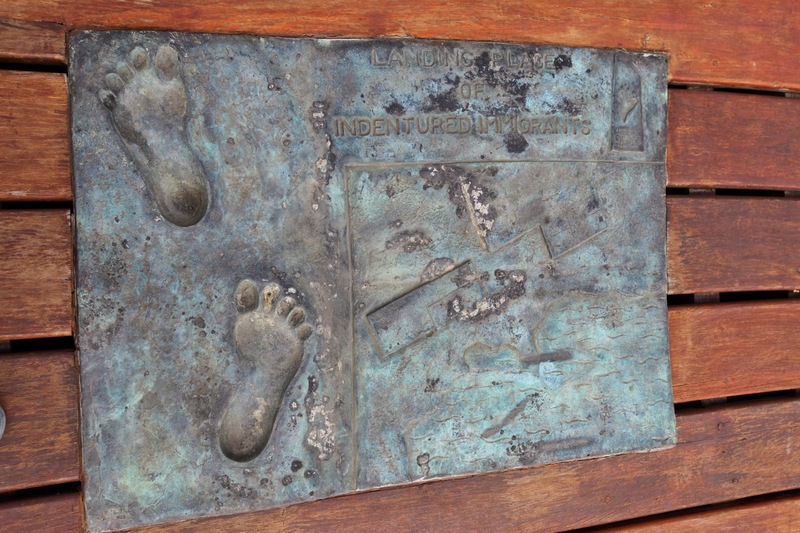 While some labourers eventually returned to their homeland, a large number of them stayed back and as a result formed the local community in Mauritius. Even today, you will meet fourth and fifth generation Indians whose ancestors once came to Mauritius through the Aapravasi Ghat, an immigration depot from where indentured labourers emerged. It is now a UNESCO World Heritage site. Mauritius gained its independence in 1968, and Sir Seewosagur Ramgoolam became the first Prime Minister. A revered man, you will notice Sir Ramgoolam’s face illustrated on Mauritian currency. The island’s airport is also named after him. While it seemed like Mauritius had successfully left behind its painful history of the indentured system, I found that it is still prevalent today. When I arrived at the airport, heading towards Passport Control, I was approached by a group of women from Bangladesh who asked for my help in filling their disembarkation forms as they didn’t speak or write English. They were accompanied by one man who spoke a little English, so I asked him their purpose of visit. He said they were all here to work for a textile company doing tailoring work on a three-year contract. It was clear that the indentured system was never discontinued. I can only hope that the living and working conditions of these labourers are humane.